Foot is the most important anatomical part of the body to balance the weight and transmit weight of the body to the ground. Foot has a dorsal (facing ground) and ventral (facing upward) surface. Bottom or ventral surface of the foot is also known as sole or bottom of the foot. Based on pressure points in the hands and feet that are said to connect to the nervous system, reflexologists pinpoint specific glands and organs to treat them via massage. Whether it actually connects to these other parts of the body is somewhat controversial. However, the simple idea of touch therapy may play a role. When we feel connected to others, we gain a stronger sense of overall well-being. In modern reflexology, the foot is divided into 12 pressure zones. PIESOLE Insoles do stimulates in some zone nerves in the feet to encourage blood flow, because of this, is thought to prevent and stop pain. Reflexologists claim to treat many ailments, particularly those associated with pain and inflammation. Practicing these techniques may help with stress, fibromyalgia, chronic bowel diseases, muscle pain, and even difficulty breathing due to tight muscles. Use PIESOLE may also promote a sense of well-being and reflect to good overall health. The foot is divided in heel, arch of the foot and anterior bony prominence of metacarpophalangeal joint. Balance Posture– Maintain equilibrium of posture while standing, walking and jogging. Weight Transmission– Transmits the body weight to the ground during standing, walking or jogging. Assist Ambulation– Ambulation is moving from one place to another place. Posture is a balanced position adopted to prevent fall or sway while standing, sitting or lying down position. Balancing and maintaining normal posture involves contraction of leg and back muscles so as to prevent swaying of the upper body. Muscle contraction underneath the foot complements the gravity force to achieve appropriate balance posture. Muscles underneath the heel are Gastrocnemius, Soleus and Plantaris muscles. Arch of the foot distributes weight anteriorly and posteriorly through tarsal and metatarsal bone to balance the posture. Spring action of the arch of the foot is accomplished by links between tarsal bones and, anatomical positions of the muscles, tendon and ligaments. Mobility of the arch of the foot keeps bones and joints in the correct alignment during various activities so balance posture is maintained. Tuberosity of the calcaneus bone of the heel anchors to the ground during standing and maintains the normal balance in standing position. Arch of the foot is the middle section of the sole, which lies between heel and toes. Bones, ligaments and tendon support arch. 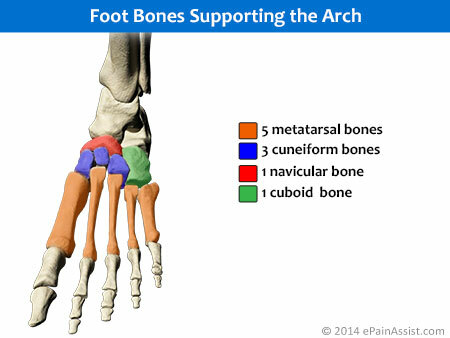 Arch of the foot is divided in longitudinal and transverse arch. Arch functions as a spring because of elastic properties of ligaments and tendons, which supports the arch and links the joints. Weight is transmitted anteriorly and posteriorly through arch. Posterior transmission of weight passes through calcaneus bone to the ground. Anterior transmission of weight passes through base of great toe medially (inner side) and base of 4 toes on lateral (outer) side. Most of the weight in standing position is transmitted to the ground from great toe and calcaneus bone but small portion of the weight also transmitted to ground from remaining 4 toes and lateral foot which is in contact with ground. Weight transmission during walking, running and jumping depends on part of the foot in contact with ground. Base of the toes are prominent bump located between metatarsal bone and phalanges. Bump is caused by metatarsophalangeal joint. Bump under big toe is prominent and most of the anterior weight is transmitted through the bump under big toe. During the action of walking and running weight is transmitted primarily through anterior sole. Less of a weight is transmitted through anterior sole during standing position, at rest or in sitting position. Heel is a posterior or back end of the arch of the foot and sole. Heel supports the arch of the foot posteriorly (backside). The tuberosity of the calcaneus bone lies against the ground in standing position. The body weight is transmitted predominantly through heel to the ground during walking. Weight is transferred to ground through heel while walking and jogging. Ambulation includes walking, jogging, jumping and hopping. Body is propelled forward, backward or in lateral direction during ambulation. Sole with abundant nerve supply and arch of foot assist ambulation. Human body moves forward, backward or in lateral position while at rest or moving. Sole and arch of the foot reinforces forward, backward, circular or lateral movements. Ambulation is assisted by various joint movements of the foot at ankle joint and toes. Dorsiflexion– Movements of the foot upward is known as dorsiflexion. Internal Rotation– Foot is turned inward also known as medial rotation. External rotation– Foot is turned outward also known as lateral rotations. Flexion– Toes are bent towards the ground. Extension– Toes are bent upward or away from the ground. Abduction– Toes are spread away from each other. Adduction– Toes are brought together. Plantar flexion and toe flexion helps to anchor the foot to ground during maintaining posture and ambulation. Plantar and toe extension reinforces spring like action of the arch and helps in propelling body in different direction. Internal or external rotation of foot at ankle joint balances the posture and assist in weight transmission.